It's no secret that we're big believers in foot toys for our birds so they are always keeping us challenged for finding new and different toys! 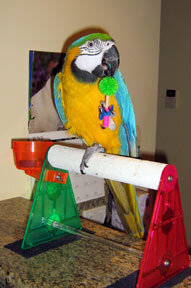 The Screwy ParroPine has combined the best of a couple of toys in one foot sized toy! You get a ParroPine at one end (our 'toos just love to pull those porcupine pieces off), a wooden dowel (no glue) holds the ParroPine on one end and the mini nut & bolt on the other! 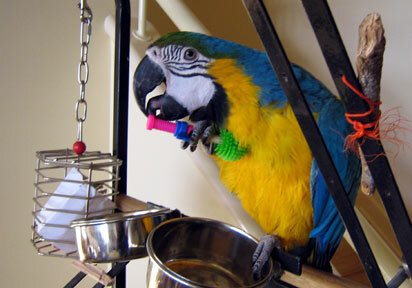 Great fun for those foot loving feathered companions like B&G macaw Jazzi, who has the privilege of being able to live in Australia with mum, Suzanne and enjoy life on various play stations as well as having a great ocean view! Jazzi is enjoying all the textures of the Screwy ParroPine. 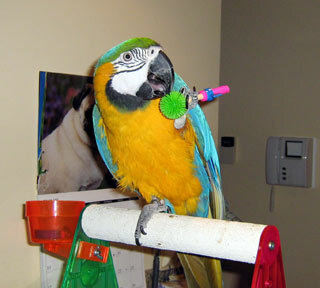 If you're parrot loves to chew on these ParroPine tips, be sure to check out Bamboo Man and Parropine Twirl!